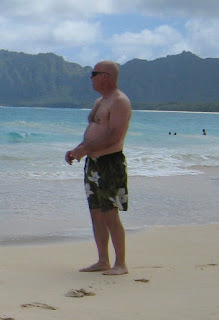 One of our clients, Ron, recently went through an incredible body transformation that I wanted to share with you. Ron had been training with us for a little while already, but he told us that he wanted to enter a focused fat-loss plan as his health was beginning to suffer due to some weight he had put on. We gave him an individualized nutrition plan, and tweaked his workouts so they would be a bit more "fat loss" oriented in nature. His results were nothing short of fantastic! See the video on the right, or you can view it HERE. Ron works full-time, both in the business world and at home as a dedicated father and husband. So, a transformation like this is certainly possible if you consider yourself a busy person (and I don't know anyone that doesn't). Ron FREQUENTLY has to travel for work - often for 5-7 days at a time. So, even for those you that travel, you can definitely make worlds of progress with a schedule that demands regular travel. Ron would tell me what equipment he had available at the hotel (sometimes the hotels didn't even have a gym), so I would give him some "hotel room workouts" in which he could still get in some training with just his bodyweight, a chair, and a bed as his gym equipment. Your improvements in the physique realm will never depend on what fancy gym equipment you do or do not have available. It's the mindset that is going to be the difference maker. Honestly, most of Ron's success was due to his consistency in the kitchen. I've said it before and I'll say it again: You can't out train a bad diet. Ron was constantly emailing me to make sure something was "approved" before he picked it up at the grocery store or added it to his meal. When he was on the road, he was sure to pick items on the restaurant menus that were going to help his progress, not hinder it. He did not count calories, eliminate carbs from his diet, or partake in anything extremely complicated. It's important to note that nutrition plans really don't have to be as complicated or tedious as many may make it seem. We did not do any carb cycling or sodium depletion leading up to his "After" picture (or at any point in his program). Ron did not do a single crunch or sit-up throughout his program. Proof that you don't need to (in fact, you can't) sit-up your way to a lean midsection. It won't happen. He performed zero steady state running throughout his program. Again, it is unwise (and unnecessary) to prescribe long distance running for someone in need of weight loss. Considering that all of Ron's blood levels returned to healthy levels during his program, this also goes to show you don't need long distance running to improve the health of your heart. Can it help? Absolutely. But I wouldn't recommend it as a modality of choice for a weight loss client. He not only maintained, but increased his strength during this phase. I can't tell you how many times I talk to people (primarily males) that are frightened they're going to "lose all their muscle" if they enter a fat loss program. It's not going to happen if you design the program appropriately. As shown in the video, Ron hit a 40lb PR on his weighted chinup, a 30lb PR on his front squat, a 15lb PR on his close-grip bench press, and a 20lb PR on his trap bar deadlift. Note that these personal records occurred during this particular 16-week program (not throughout the few years he's been training with us). Ron just turned 51 years old. 'Nuff said.